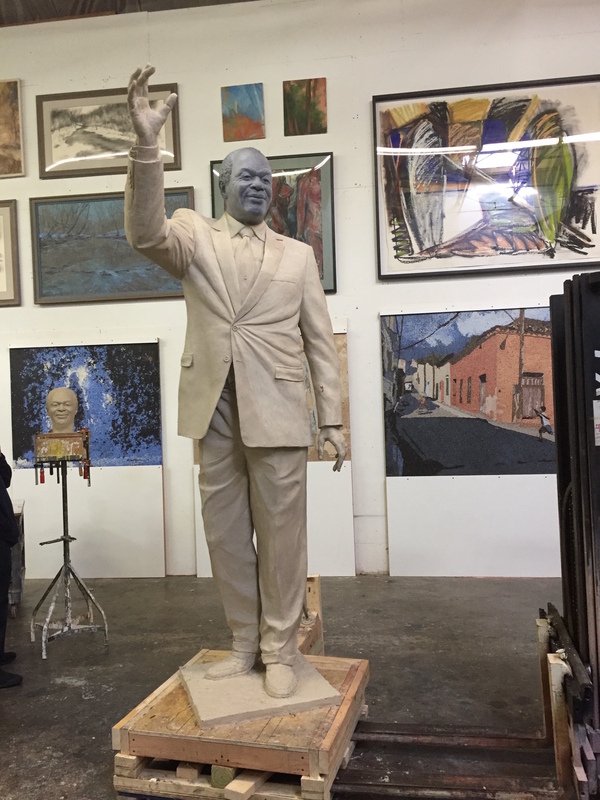 The design for a new statue honoring D.C. former “mayor for life” Marion Barry was presented to city leaders last week. A friend of Barry’s was the model for the eight-foot clay mold, which will be cast into a larger-than-life bronze statue by artist Steven Weitzman. After it is cast and transported, the statue of Marion Barry will stand outside the Wilson Building in downtown D.C. The Brentwood-based sculptor, whose works can be found throughout the D.C. area, was selected from among 13 artists bidding for the commission. Arthur Espinoza, Jr, head of D.C.’s Commission on the Arts and Humanities, says the model for the statue even wore one of Barry’s suits in order to be as realistic as possible. “There’s details in the tie clip, the belt buckle, and this here shows quite frankly Mr. Barry’s favorite shoe style: snakeskin,” Espinoza said. The Executive Office of the Mayor and the arts agency commissioned the work after deciding a statue was the best way to honor Barry’s contributions to the District. Barry passed away at the age of 78 on Nov. 23, 2014. The statue is expected to be installed in about four months. It is expected to sit on a plinth in a small garden in front of the Wilson Building, D.C.’s city hall. The statue’s pedestal will include several famous phrases attributed to Barry. Its unveiling has been set for March 6, 2018, which would have been Barry’s 82nd birthday.